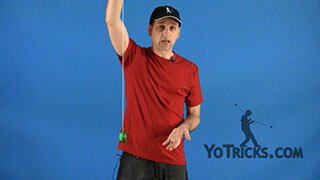 Learn about what design characteristics make a yoyo good for learning horizontal style tricks. 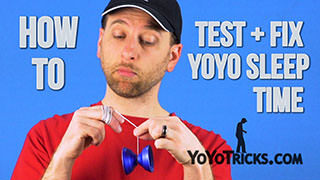 How to Choose a Yoyo for Horizontal Play Yoyo TrickIn this video we are going to show you how to choose a yoyo for Horizontal Style tricks. If you are not sure what Horizontal Style tricks are, if you think about regular 1a String Tricks, the yoyo is usually right in front of you and it sits on the string and the yoyo is setup in a vertical fashion. For Horizontal Style tricks the yoyo instead is going to be raised up and angled, usually at a 45 degree angle or more, and, as you can imagine, that makes the tricks a whole lot more difficult to do, you need different techniques to make the tricks work, but it also makes it a lot more exciting, which is why people are interested in getting into this particular style. What this video is all about is figuring out what are the characteristics that you can look for in a yoyo to be able to predict that that yoyo is going to be excellent for learning Horizontal Style play. What we are going to do in this video is we have identified a number of characteristics that do make a yoyo good for this style and we have listed them in order of importance. The first thing we talk about is going to be the most important, and then as we go down the list the last few in particular they are still helpful, but they are not quite as critical as the first few. That is just something that is good to keep in mind. What you will find is that as you get better at Horizontal style play, you will be able to compensate for deficiencies, if your yoyo has them. So, if your yoyo does not have every single thing on the list, most likely you will still be able to find ways to do use them in a Horizontal fashion. So, this list is kind of flexible and you either want to find the one of the yoyos that you already have that is the best and start working with that, or get a yoyo online that possesses as many of these qualities as possible. The first thing on the list, the most important important quality that a yoyo should have is very low walls. What I mean by that – and most yoyos have this quality – is when you take a yoyo apart, if you look at the response pad area you will see that the angle coming down on the rest of the profile it starts to drop away from the center of the yoyo almost immediately after the response pad. This is called a “zero wall” design. It is called a zero wall because, if you look, there is almost no wall there at all. Right from the response pad it falls away. The lower this particular inner wall is, the better it is going to be for Horizontal Style play. Let me show you why. If you take a yoyo that has a higher wall, in this case a ONE, and this yoyo is designed more for beginners, and it is really good for them, but if you were to try to use this for Horizontal Style play what you would notice is that it does have this really tall wall here. You can see how much distance there is before the wall falls away after coming off the response pad area. When you put it together, when you think about the yoyo in a horizontal trick position, you can see how far away from the center of the yoyo the string begins to touch the edge of this wall here. What that does, because it is so far away from the center, that really increases torque on the yoyo, which basically means that the string is applying a lot more force to the edge of the yoyo as it is spinning. This will not only kill the spin, but it will cause it to turn off the plane you want it to be on a lot more quickly, which is going to make it so much more difficult to manage these tricks. That is why it is better all the way around to find a yoyo with a really small wall, or a zero wall design, and that will definitely help you out. The second thing that you want to keep in mind is you want a yoyo with a profile shape that minimizes contact between the string and the profile. Let me show you a bad example of this first. A lot of yoyoers know that an organic, or curved, shaped profile in a lot of cases makes yoyos a lot more difficult for learning horizontal style tricks. This is why. If you think about where the string would be when the yoyo is in a horizontal position you can see that the string basically hugs the curve of the yoyo right here. It is touching it all along the entire curve of the profile, and every point at which it is touching it, that is increasing friction, and again that is increasing the force that the string is applying to the side of the yoyo which, again, will make it go off plane, and as we said that also kills the spin. What you want instead is a design that is going to minimize the points of contact. If you look at something like the Atlas you can see that is has a nice curved, concave shape here. When the string does touch the side of the yoyo here, you can see that it is not touching all the way along this inner curve, it only touches the yoyo at this one point. That helps to reduce the force that is being applied to the side of the yoyo, it helps reduce the friction, so the yoyo can spin a lot longer, play a lot better, it can stay on the plane, which will make your tricks easier to do. If you look at a lot of different yoyo designs, there are a whole bunch of different ways that designers have found to minimize points of contact. In this case it uses that nice concave curve and that achieves it. If you were to look at something like the Canon, the Canon has what is becoming a more common design element, it has this little tiny step coming off the response pad area before it goes in on the rest of the profile. What that step achieves is this same thing, where it is minimizing the contact between the string and the profile of the yoyo. During this entire line right here in the profile of the yoyo, the string never touches that, because it is interfered here and down here with those two angles. Really the string only touches the yoyo in those two points. If you look at other popular yoyos that have proven to be adept at Horizontal play like the Shutter you can see that this whole area of the yoyo right here has been cut a little bit deeper before it gets into the rest of the profile, so when the string touches the side of this yoyo, in that whole area the string never touches it. There are a whole bunch of different ways to achieve this, and designers have found different ways to make it work. 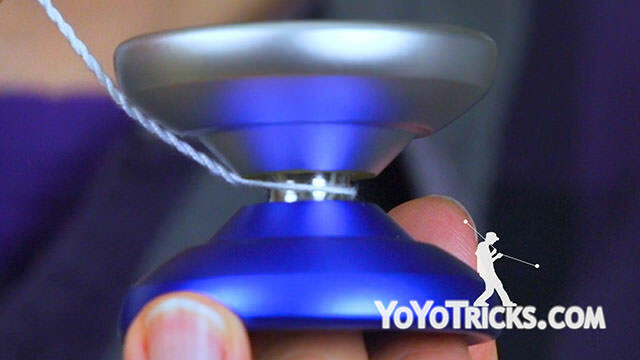 It is pretty easy to test it, you just hold the string up until it touches the side of the yoyo, and you can see how much of the string is engaging with the profile. The more it is, the more tricky it is going to be to make that yoyo work for horizontal style tricks. That actually leads into the third point, you want a design that has a higher angle before the first contact of the string with the profile of the yoyo. So, what do I mean by that? If you – again, let’s take the Atlas as an example – if you look at a yoyo just like, how far up can you raise the string before it touches the side of the yoyo? The higher that angle is, it actually gives you more flexibility. It is kind of how sloppy you can be with your technique before it will start applying a lot of force to the side of the yoyo to make it turn. If you have a really steep angle, the whole time the string might be angled like this against the yoyo you are not going to experience too much change in tilt until it actually starts to touch the side of the yoyo and push it over. You can see with a lot of these popular yoyos that have shown themselves to be adept at Horizontal style play there is a range of angles that can work, but in general, the larger the angle the easier it will be to land your horizontal style tricks. The next thing is that yoyos that are heavily rim weighted tend to play a little bit easier when you are learning Horizontal Style tricks. This is true whether it is just a weight distribution thing, or the weight is just pushed out more to the outer edge of the yoyo, or if the yoyo is bi-metal, because bi-metals tend to center the weight in one place and that tends to be on the edge. The reason why these are good for horizontal style play is because yoyos that are more rim weighted tend to be more tilt-resistant and their spin tends to be a little bit more powerful. So if you think about this in terms of horizontal style tricks, even when the string is pushing into the side of the yoyo, because it is more tilt resistant it will have a tendency to stay on the plane you want it to stay on. It will not change that angle and the friction of the string against the yoyo is not going to kill the spin quite as quickly. The next thing has to do with the bearings. For horizontal style play, string centering bearings like center trac or konkave are going to play better than flat bearings. This one is pretty straightforward. If you think about a yoyo being kind of horizontal or off-axis, the string on a flat bearing has the potential of pushing right up into the side of the yoyo, even in the very center of the yoyo. Again that just increases friction and that is just something that you do not need. So a string centering bearing will just keep the string away from the walls of the inside of the yoyo as much as possible. It is something that you can really feel if you take one yoyo and swap out a flat bearing for a center trac or go the other way around, you can feel the difference and it is a much better play experience with a string centering bearing. 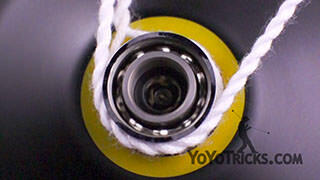 The next one is that yoyos that are wider also make it a little bit easier to learn tricks. Again, this, in some sense is kind of obvious. Where you just keep landing onto the string, and since it is horizontal, it is a little bit more tricky to do that. So yoyos that are wider just give you more room and more flexibility and make it just that much easier to consistently hit the strings that you want to hit. Then the last thing is that if you watch a lot of players do their horizontal style tricks, especially in contests, they tend to do them extremely fast. The reason for this is that gravity is always trying to pull the yoyo down. So you need a lot of forward force on the yoyo in order for it to stay at that angle and not have gravity pull it down so that the strings touch the side of the yoyo. Since tricks tend to be faster, it just makes sense that yoyos that play on the faster side, make learning these tricks a little bit easier. Again this is lower on the list You do not absolutely have to have a yoyo that plays fast, it is just one of those things that seems to help a little bit. So when we teach our horizontal trick tutorials, the yoyo that we are going to use is the Atlas. If you kind of compare the qualities of the Atlas to this list, you can see that it checks off just about every box. But you will also notice that it does not check off every single box. The Atlas is not a yoyo that is really really heavily rim weighted like we recommended. That just goes to show that this list is more of a set of guidelines, these are not rules that you need to follow in order to find a yoyo that will work. These are just things that in general will help the yoyo play a little bit better. So if you look at your own collection, you should be able to kind of compare to the things on this list, and figure out which yoyo is going to work the best. Or if you are going to be buying a new yoyo then you can pretty much get a good feel for whether or not it will play well horizontal, just by looking at the profile and considering the weight distribution. So, pick up a yoyo and get ready to learn some horizontal style tricks.